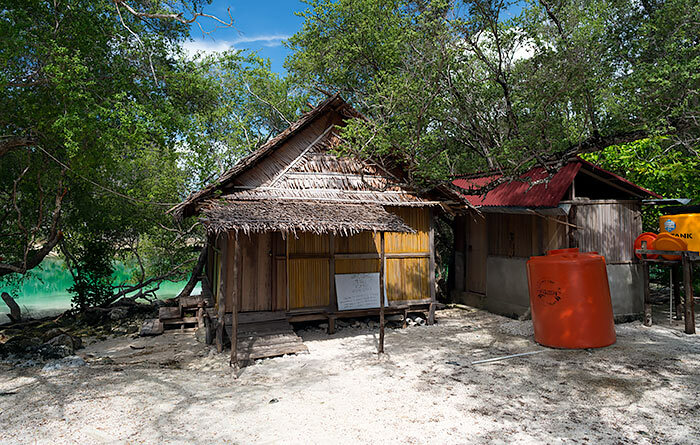 Rufas Homestay - Raja Ampat accommodation near Piaynemo, Pam Isls. 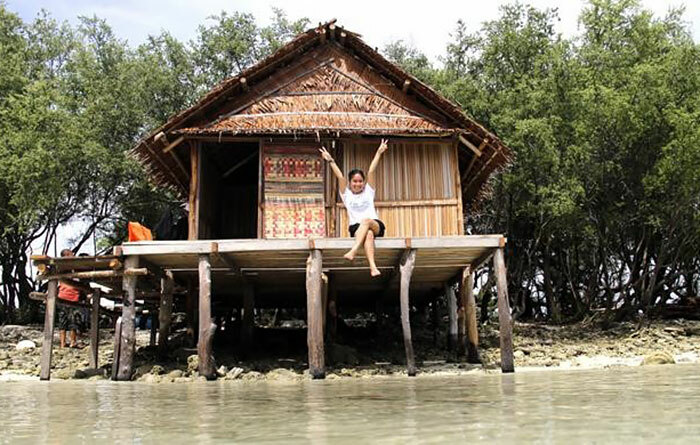 Rufas Homestay sits beside its own private lagoon on Pulau Rufas – a tiny islet just off the eastern coast of Piaynemo. 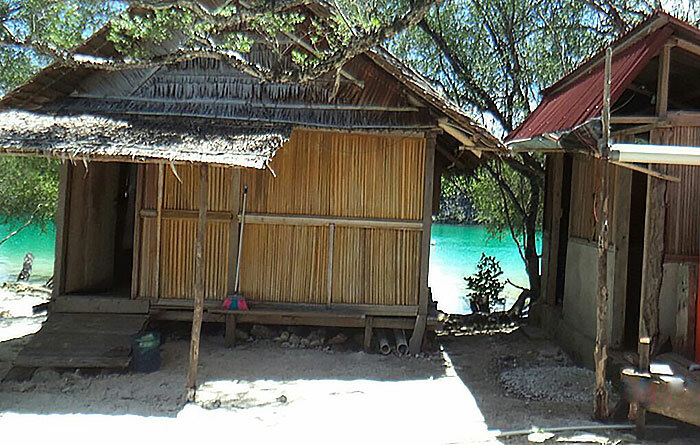 Two two-room bungalows and a private bungalow line the beach of Rufas Homestay’s private, coral-filled lagoon. Shaded by small trees, each bungalow sleeps two in mattresses on the floor. 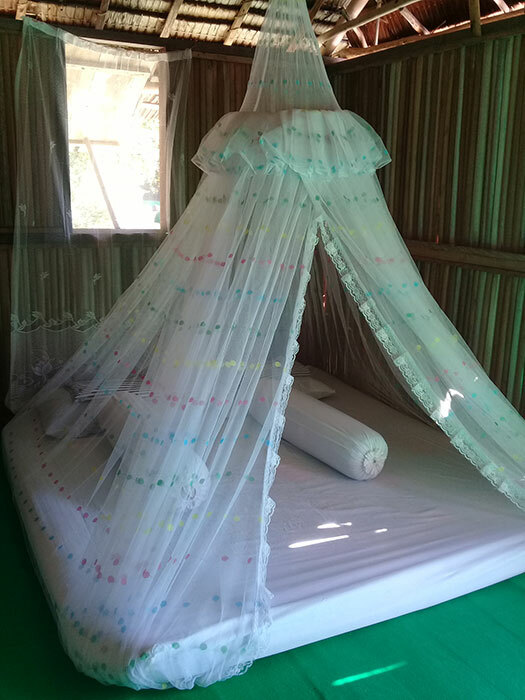 Bedding includes mosquito nets, sheets, pillows and bolsters. 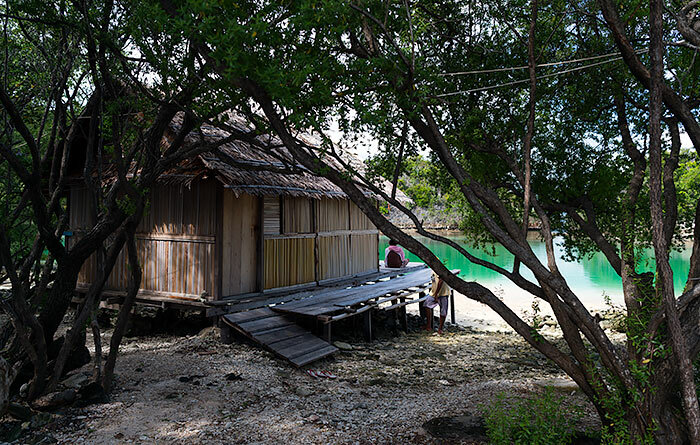 Each bungalow has a small deck overlooking the jade waters of the lagoon. 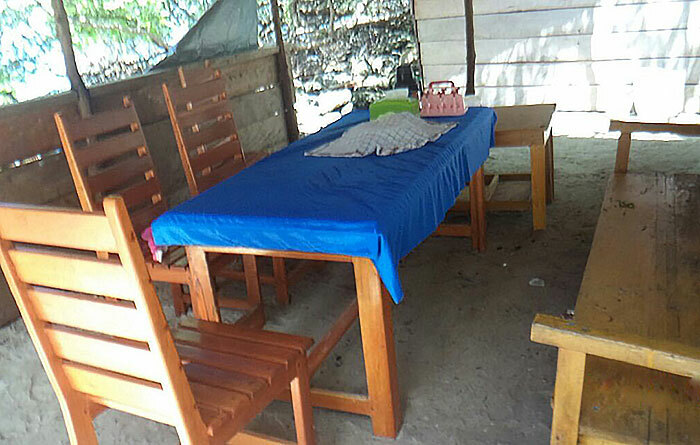 Meals are taken in a dining shelter that is equipped with a large table and long benches with backrests. 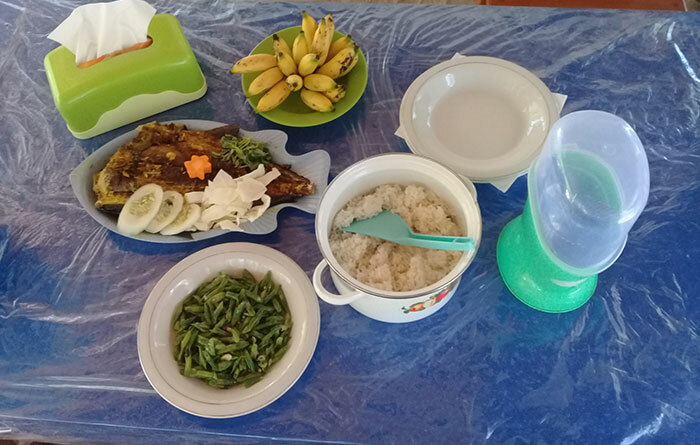 Rufas Homestay provides guests with free drinking water, tea and coffee making supplies in the dining room. All guests share a bathroom building that has two separate rooms with tiled floors. 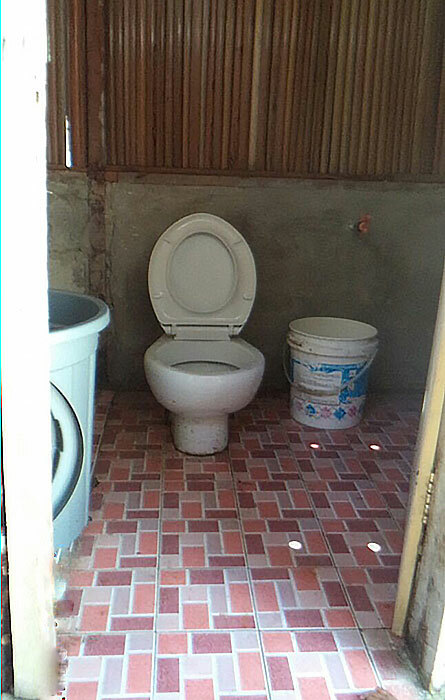 A western style toilet is located in one. The other has dip-mandi (bucket) bathing. Rufas Homestay also provides two decks that are equipped with recliners. Both are fabulous places to relax. 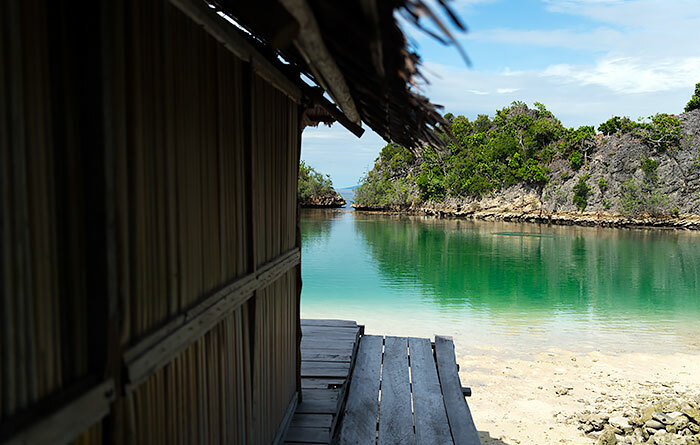 One is at the end of Rufas Homestay’s dock boardwalk and has views to Piaynemo and the ocean to the north. The other is at the southern end of the lagoon. See the photos in the gallery above. Electricity is provided by generator and is available all night. There’s a good 4G phone signal available at Rufas. 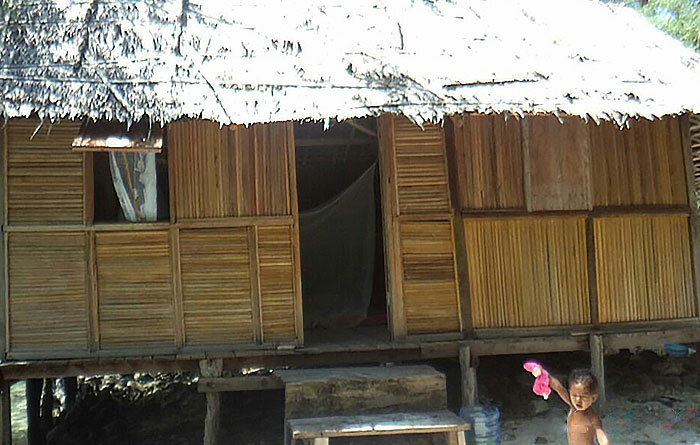 The nearest village to Rufas Homestay is Saukabu on Pam. 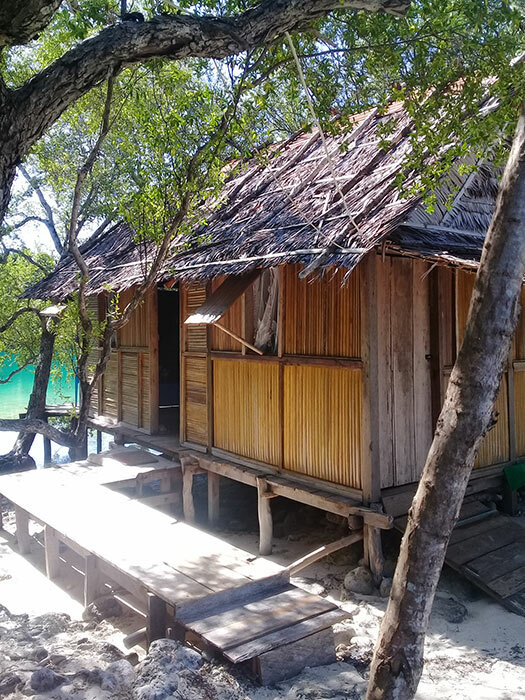 Saukabu is about a 15 minute boat ride away and only basic supplies can be bought there, so you’ll need to bring everything you consider essential with you. Very little English is spoken at Rufas Homestay, so bringing a phrasebook to ease communication is best if you have no Bahasa Indonesia. 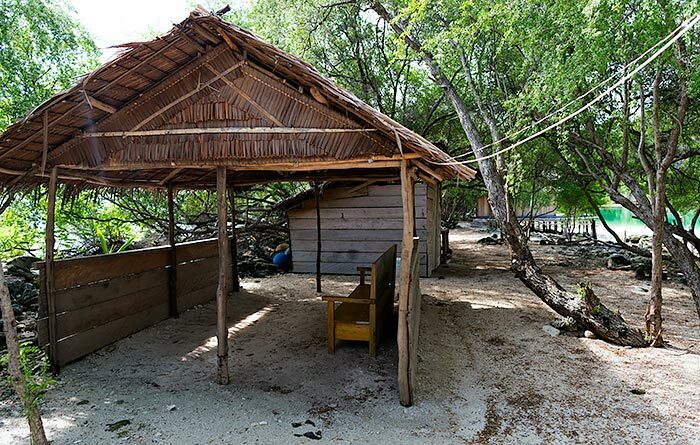 There’s no safe waste disposal on Pulau Rufas. All inorganic waste must be either burned or carried away. If you don’t want to contribute to the trashing of paradise, please take all the inorganic waste you create away with you when you leave. 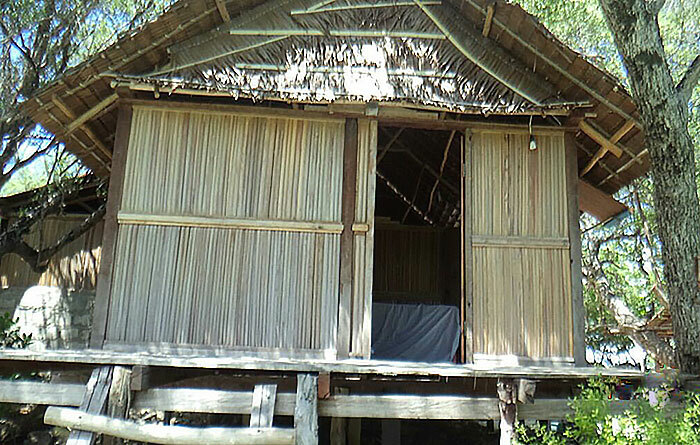 Transfers between Rufas Homestay and Waisai cost IDR 2,500,000 each way. A speedboat which can carry up to 8 people is used, and the trip cost is shared by passengers. 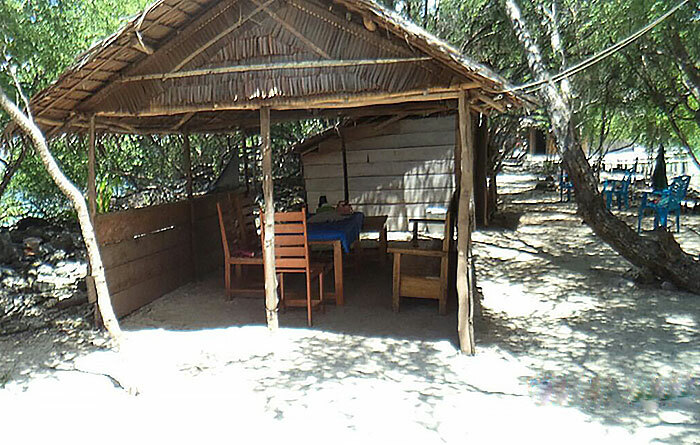 Snorkelling, swimming and relaxing are Rufas Homestay’s main attractions. 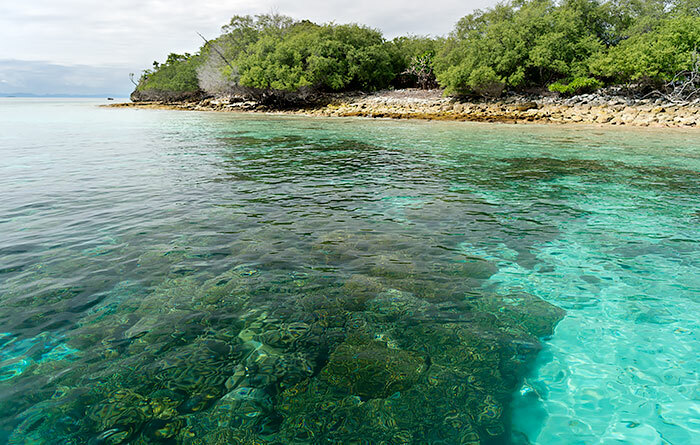 The coral-rich waters of Piaynemo are a snorkeller’s delight. In addition to the lagoon itself (which also affords easy swimming over a sand bottom), the famed Melissa’s Garden site is close by. 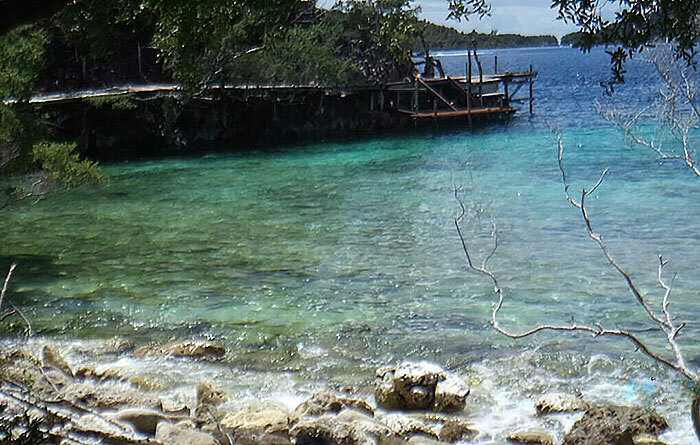 The waters around Pulau Rufas are spectacular. 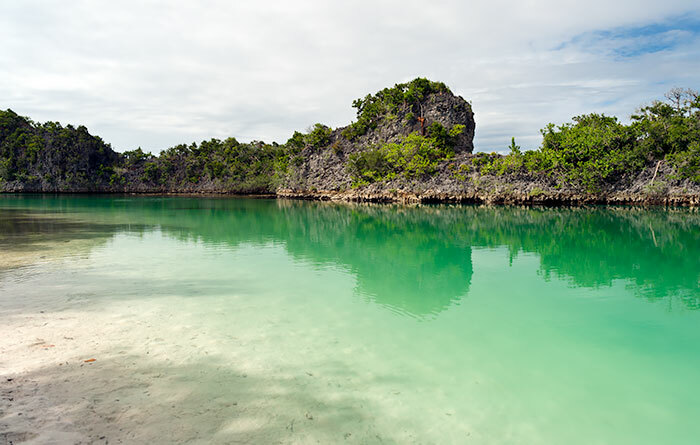 Do be aware of tides and currents when snorkelling outside the lagoon though. If you’re lucky, you’ll get to meet the large moray eel that inhabits the lagoon. He’s something of a pet – but don’t try to pet him! The attractions of Piaynemo are very close to Rufas. 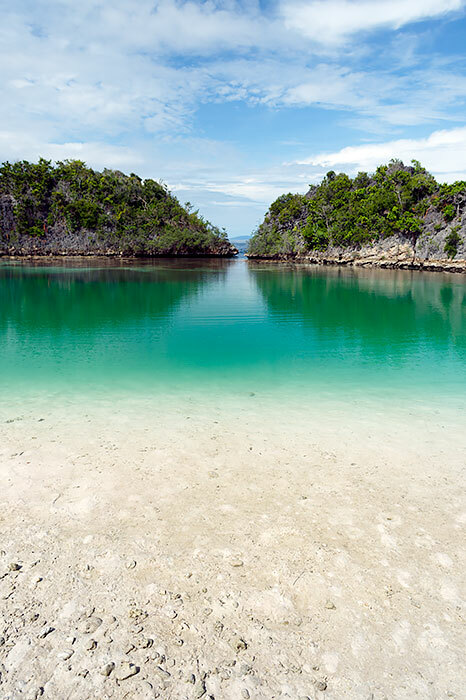 You could also arrange to spend a day exploring and snorkelling Piaynemo’s “back beach”, which is accessed via Piaynemo Homestay. 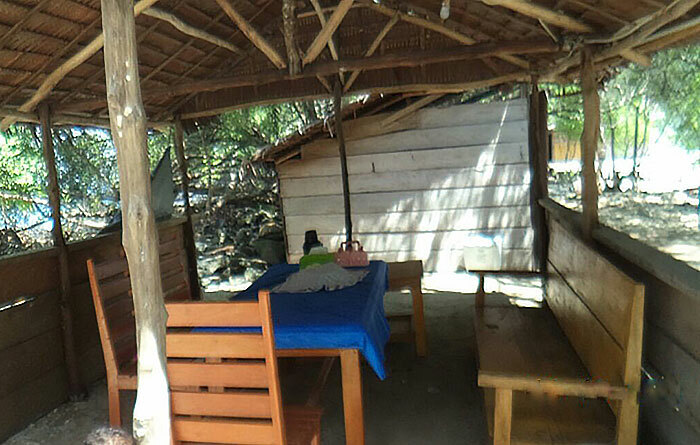 If you wanted to make a day of it, meals can be purchased at Paiynemo Homestay’s restaurant. My wife and I stayed here for 4 days in March. This is our favourite places of seven we visited during 5 weeks in RA. The famous Piaynemo is just opposite and there is also a wonderful look out on Rufas itself. Aries who stayed in Waisai always reacted promptly when I asked for reservation and pick up – thanks for that! I had originally booked to stay at Rufas for 2 nights but when I arrived the homestay was full even though I had texted them the day before to confirm my arrival. Fortunately they managed to find a room in the back of one of the huts which was appreciated after a long rough trip to get there. I ended up staying only one night. The place is beautiful but quite exposed. I arrived on a very windy day and was still shaken by the rough trip. I also found it quite crowded for such a tiny atoll. There were 10 other people staying there (plus the host family) and the area in which you can walk around is very small. The snorkelling inside the lagoon was not as nice as the water was quite murky and with lots of filamentous green algae although some of the huge coral formations were quite incredible. The snorkeling outside was fantastic although I didn’t explore everything as I was alone and weary of strong currents. The view at the top was great. There is no generator on the island (that I could see or hear) and power is supplied by battery which is great as there is no noise but not as reliable. The host family were very friendly, helpful and accommodating and the food was great. It’s great for a day trip but I would probably only stay there for 1 night at the most. We stayed at Rufus Homestay February 9-16,2019. The place is amazing and worth the long journey to get there! I would like to address some of the complaints I have been reading. Rufus seems to extend the visits of people who are already there, especially if they are not sure you will be coming as planned. 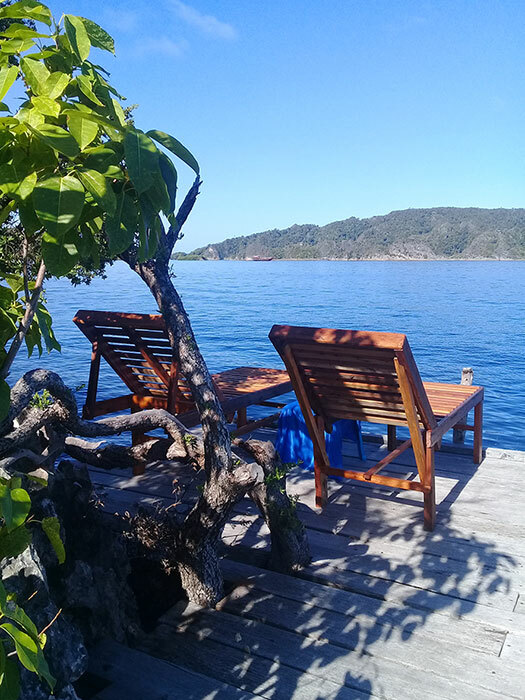 My solution was to book with Stay Raja Ampat and then send an email every few weeks stating my reservation number and a note saying yes I am still coming! A week before my dates I sent an email with my reservation number telling them what Ferry I was arriving on from Sorong and asked for specific instructions on who would pick me up at Waisai. This gives them time to arrange transport for you. Second… the food is poor, monotonous and not always enough to fill the belly. I would pay extra for more fruit and fish etc but it is what it is…. the poor girl doing the cooking only has the food they give her to cook, which is rice ,vegetables and eggs. She does wonders with those basic ingredients! So… the solution is to bring some food. We brought Mie Goreing instant noodles, coconut cookies,a can of sweetened condensed milk,for our coffee, packets of instant coffee and hot chocolate, some hard candies and some fruit. All of this food was hung by a cord from the rafter to avoid rats. With those problems solved, the place is a paradise! 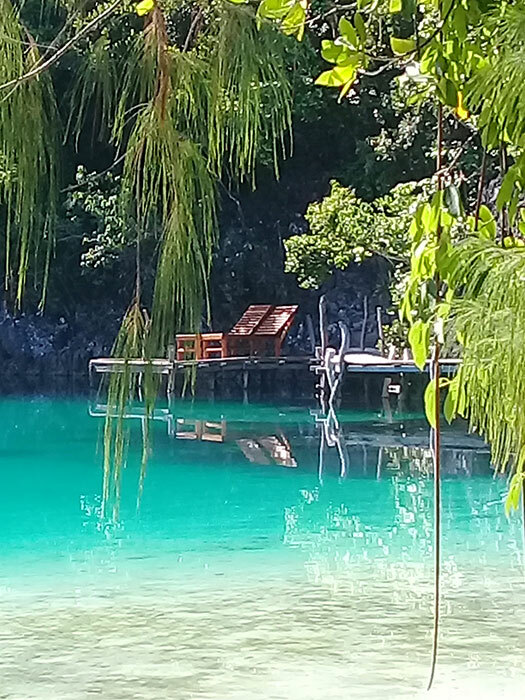 Snorkle in the lagoon, out the opening to the right and around the island to the dock. Best time is at high tide when there is little current. 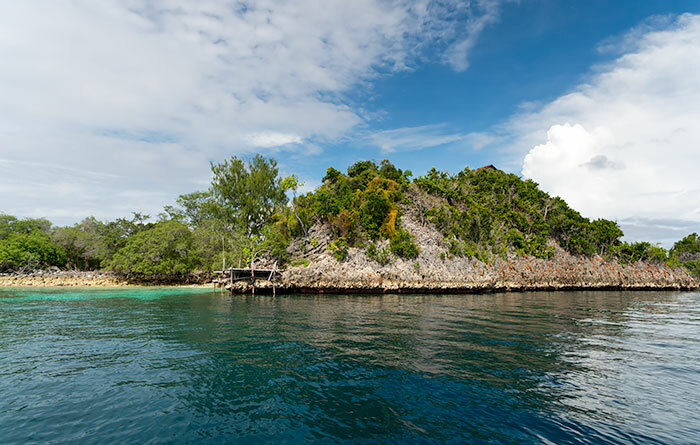 You need to dive under the little bridge of coral that connects to a small side islet or simply swim around the islet! You will see many black tip sharks. They are as afraid of you as you are of them. They eat small fish, not marine mammals. 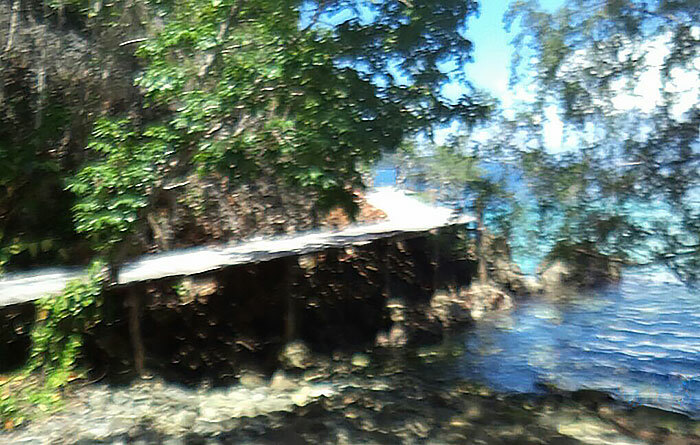 The north side of the island ( behind the bungalows and opposite the lagoon) is often rough with waves. If it is ever calm though, the reef there is fantastic! Lots of fish and very healthy coral, both hard and soft… it is a beautiful coral garden ! 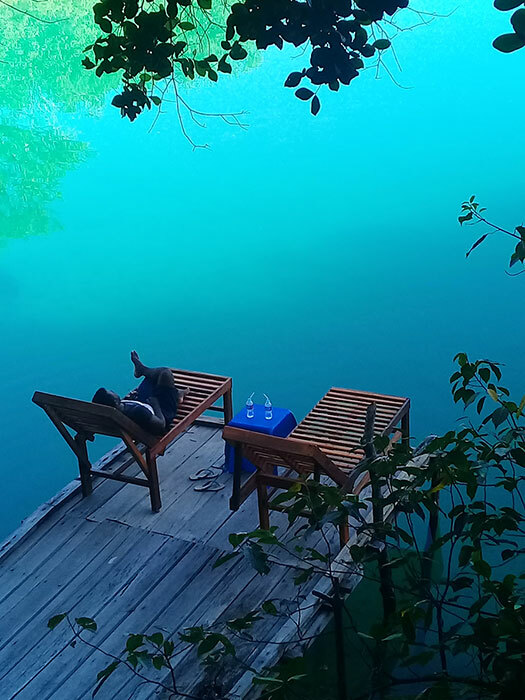 Papa Soloman will also take you to neighbouring snorkle sites and the Piaynemo viewpoint is worth the admission. Melissas Garden is too deep to enjoy snorkelimg, but Fam Wall was great, with lots of soft coral like Freiwen wall. Napolean reef was also good. We are planning to return next year! We stayed at Rufas for 4nights in February. Loved it to the moon and back. But let me start from the beginning. . The pick up was on point in Waisai. It was not Rufas’ own boat (we noticed later). The 2 guys said no no not need. After 20 minutes they stopped and said : cover bags. LUCKILY we have been traveling before and had 2 big plastic bags(160 litre)with us. We had to cut one open to cover the big backpacks and one plastic bag we stuffed our carry-on bags in. And then the hell trip began. The boat men laughing, while we where terrified!!! I fell of my seat 3 times! Like a ping pong ball on the seat. We screamed a few times and they just kept going in same speed. It was the worst worst ride ever!!! At one point one motor stopped also. That is really dangerous for back injuries to drive like maniacs in that sea!!! Many days after I had blue marks on my arms, legs and my back. In the afternoon new guests came with Rufas’own boat. Their ride was 3hour and they also had a stop to rest/look around. Sound from the waves and birds. Ariens brother (I forgot his name, I’m ashamed) ask if you want to to do trips. It is close to Piaynemo. ~7minute boatride there; 400.000 for the boat incl fee to Piaynemo. And a tour around the area also. 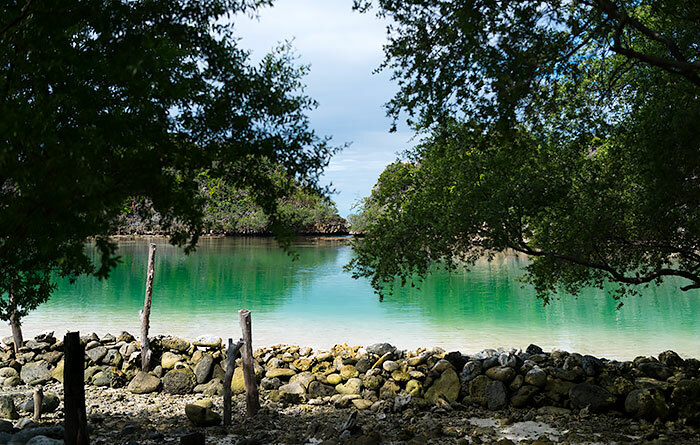 Perfect lagoon to swim and snorkel and just at the opening and outside the opening it is FABULOUS snorkeling! Compare to other homestays the food was worst of the 3 we stayed at this trip around. It really needs to improve. Clean – both bungalow and toilet/shower. And also , we had a bed! 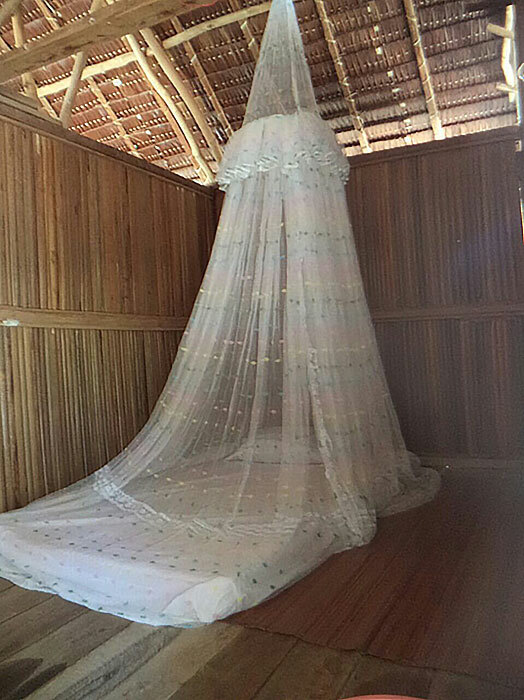 Not only a mattress on the floor. The place is good also since it is close to nearby snorkeling places/ diving. Beautiful place.. amazing private lagoon.. i hope one day i can come again.. thanks for kaka ari and fam.. very kind people.. Stayed here in mid February, the island is something really unique, bungalows overlooking the lagoon are well built & comfortable. Food was the worst we has in RA & the place has lots of mosquitos. Amazing house reef & great 360* look out tower to enjoy sunrises & sunsets. Please be careful about booking Rufus homestay. Owner not serious, over booked many time. They not inform you noting, they just not come pickup you in Waisai port, and you will have many problems find new home stay on arriving day. 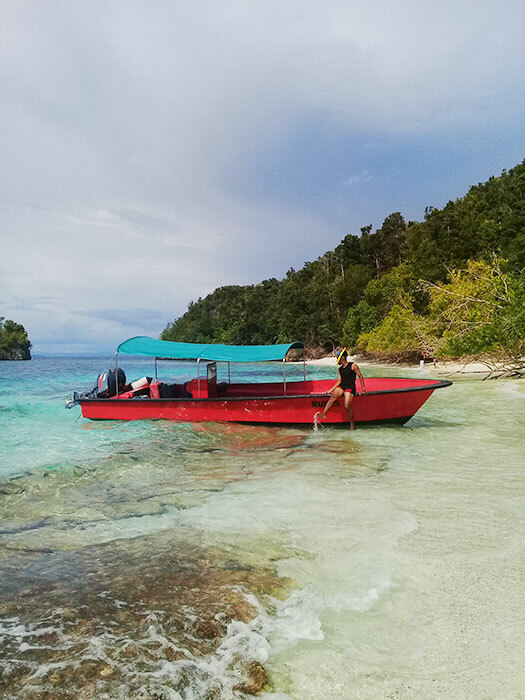 While not 100% fail-safe, using Stay Raja Ampat’s booking system is by far the most reliable method of booking homestays and organising Waisai pickups. I was meet other people who say to me it’s have same problem with Rufas homestay, over booked many time and they not inform you about overbook, just not come pickup up you in the Waist port. When they called Rufus owner say it’s have problems with boat engine or something! Stayed here for 5 days in January. Incredible. My favourite place in the world. 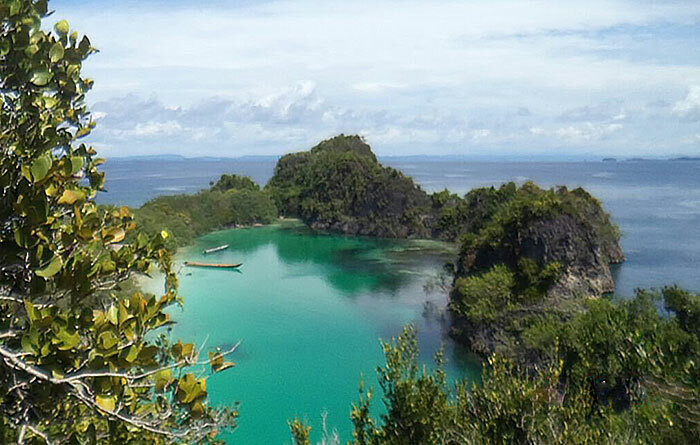 Rufas has the best snorkelling in raja ampat, there are sharks, turtles, mantas, dugong, parrotfish, you name it, they have it. 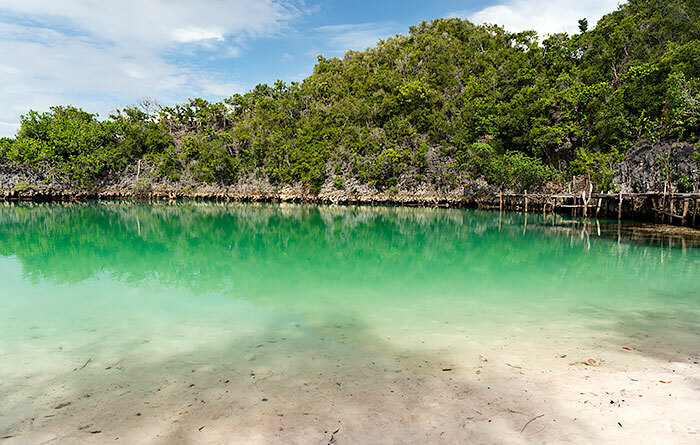 The lagoon is always warm and is filled with baby sharks and plenty of interesting fish. The lookout is a highlight. Bring a hammock and enjoy afternoon naps to the sounds of waves crashing against the cliffs. Amazing. Food was not the best we had in RA, but given the remoteness, I was impressed. The local family are also lovely, though we were lucky that a papuan teenager studying to be a tourist guide was staying there for a few weeks and was able to translate for us as the family are not strong English speakers. Piaynemo is literally across the water from Rufas, so do that tour from here for very cheap. There are 4 bedrooms, each of which accommodates two people (either in a double or two singles). Rufas Homestay is a hidden gem. We had a fantastic time with the family who looked after us very well and organized trips to our needs. Their family became part of our family and we enjoyed getting to know them. 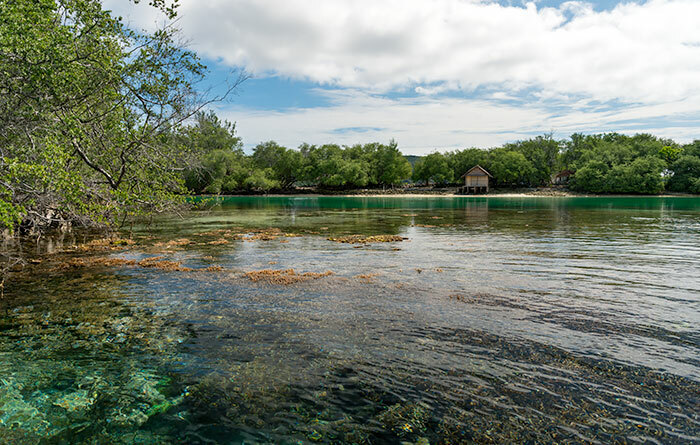 The lagoon itself offers some good snorkeling and just outside by the jetty you will find an amazing coral reef – beware of the currents though! Food was basic, which was to be expected due to the remote location, but it was tasty and we didn’t go hungry. Just not much variety, but that’s something one can easily deal with. 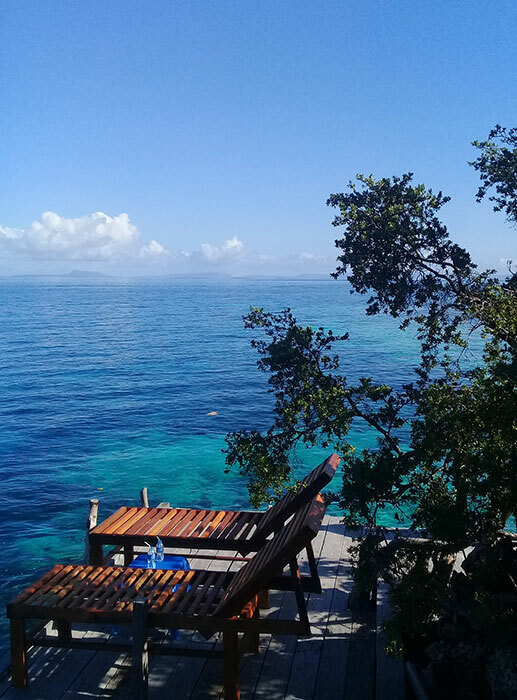 Overall, if you want to be near Piaynemo (5 minutes by boat) and some great snorkeling sites (Melissa’s Garden, Long Beach, Napoleon’s Reef, Fam Wall), then this is the place to be. In our 5 weeks in RA visiting more than 10 homestays we realize how difficult it is to choose them upon the comments. We try to give one star for each: beeing welcome by the staff/owners, accomodation/cleanness, food, housereef and trips. In november 2018 we stayed 3 nights at Rufas homestay. 1. star: We were warmly welcome by the managing family of Edi. There was a very relaxed, friendly athmosphere on the island. 2. star: Accomodation- the rooms and the bathrooms were clean. No star for food- however in this place we knew from the beginning it is quite a way to organise vegetables and fruits in eather direction. We saw Edi in the morning and evening going out to try to catch a fish- he was unlucky but thank you for trying. 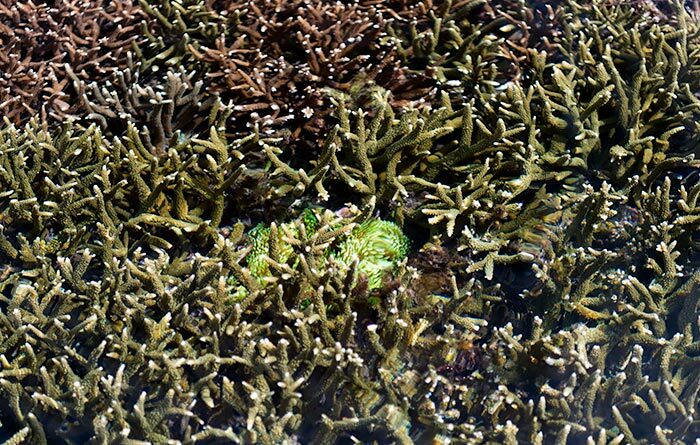 3. star: The housereef arround the lagoon is amazing- soft and hard corals. We were unlucky to be in the jellyfish season of beginning of december there. 4. star: Trips to the main snorkelling spots are just arround the corner. The prices are fair for RA, and there is an official table in the dining area with prices on it, even the discount for the 15ps boat are written down. This was objectif and helpful for planning, thank you Rufas. It looks like I forgot the rating: 5 stars! We stayed for 4 days at Rufas Homestay and had an excellent time. 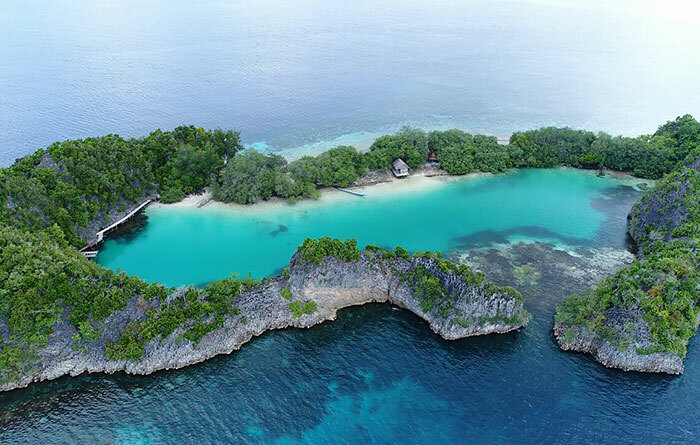 The island with the private lagoon, the great snorkelling opportunities and the viewpoint is just perfect. Edi and his family were very caring about the needs of there guest. 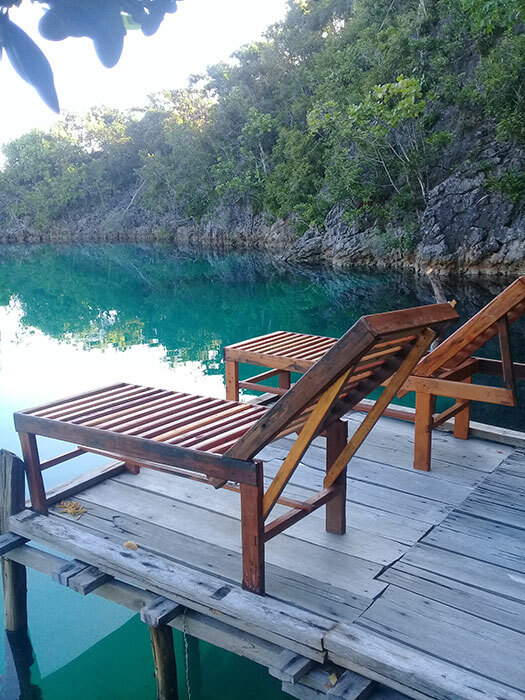 Edi asekd every evening about the plans for the following day and even joined the snorkelling trips to check out the current and to show the underwater world. I hope, that this island will stay as beautiful as it is now and can only reccomend to stay at Rufas Homestay. 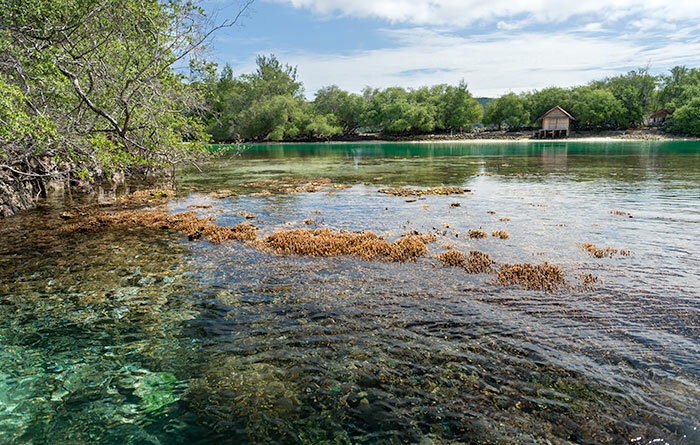 The island is a jewel with its own lagoon and the abundant corals in front of the homestay! The hosts are very kind and attentive. They proactively ask about your plans, making suggestions and finding solutions for all the small problems in the life of a tourist. Hope that the island’s beauty will be preserved as it is really unique. As advised in your acknowledgement email, you will receive a reply within 48 hours of submitting your booking request. Don’t know why that would be Jen. They may have lost their phone, they may have dropped it in the water, or they could be out of phone credit or signal reception area. Most homestays respond more reliably to bookings sent via the website booking system than by any other method, though. All we can suggest is to keep trying. I took the public ferry from Rufas back to Sorong and here is some additional info. My boat left on Saturday at 8.30am from the Pam (Fam) village. It took roughly 4 hours from Pam to Batanta and another 5.5 hours to go from Batanta to Sorong. I arrived in Sorong at around 5.30pm. Thanks for the info Alfredo! :) How was your stay at Rufas? Fist we’ve tried to organise a pickup from Arborek. We were told that the boat was currently in Waisai and would pick us up at 1pm that day. We’d been waiting the whole afternoon, but the boat never arrived. In the evening we eventually managed to call Rufas owner and were told that the boat engine was broken. He said they might be able to pick us up the next day in the afternoon. Obviously, we didn’t really want to waste more of our precious time here waiting for a boat which “might” come, so we decided to get to Pam with different Homestay instead, spend a night somewhere else and move to Rufas the day after. We told Rufas our plans, managed to get picked up from Arborek the following morning by a guide from Pam Guesthouse, Uri, whom we asked to call Rufas Homestay and book two nights for us one day in advance as he seemed very keen to help us. We were told everything was sorted out. However, when we arrived to Rufas Homestay in order to stay there the 2 nights as arranged, we were rejected as there were supposed to be 4 people on a way to the homestay and there was no space for us. 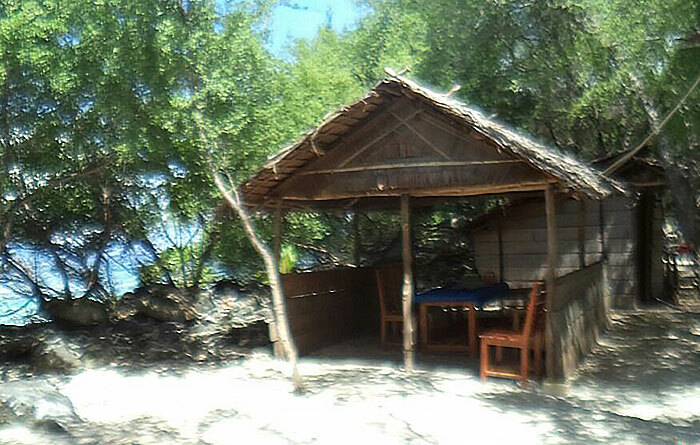 One couple was just about to leave and they were happy to vacate their bungalows for us, but we were rejected anyway. 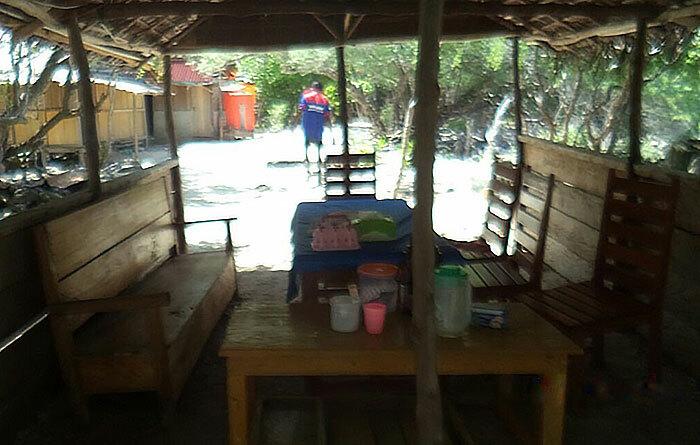 The owner of the Homestay was not present at the site and did not respond to any of our calls. We do not know whether the owner was punishing us for not waiting for his boat or there was a bad blood between the guide and the homestay (as he was supposed to do some guiding service for Rufas). 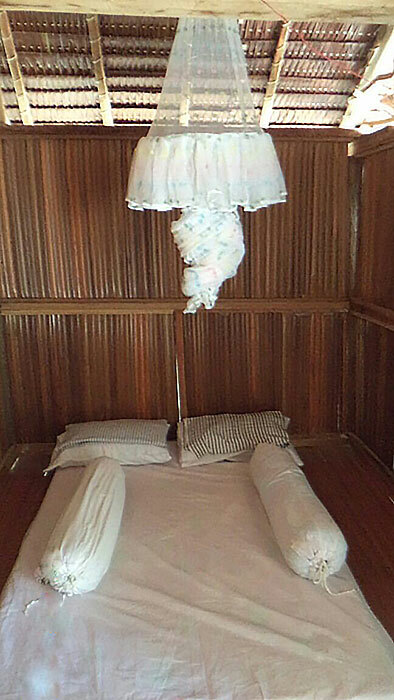 Either way we cannot recommend this Homestay at all. 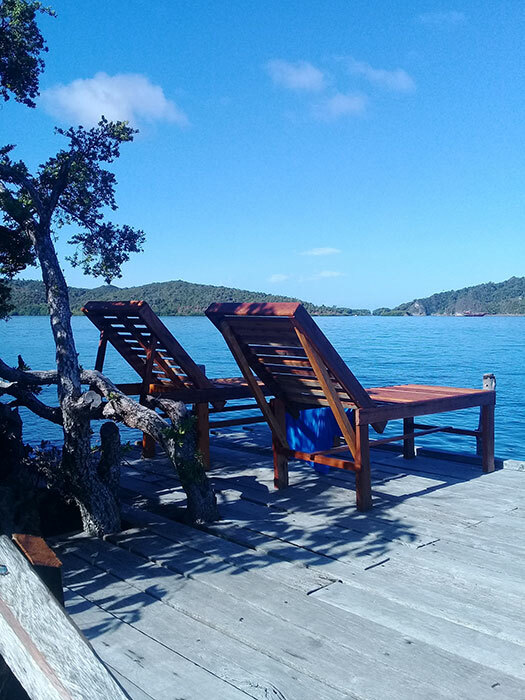 Do not take me wrong, the island is amazing, viewpoint with a view to the lagoon is stunning, but the way this homestay treats their clients is unprecedented. The three of us were deeply disappointed. You’re welcome to join our facebook Travellers’ Forum and post this question there if you like. It will definitely increase your chances of a response. BTW – please only apply star ratings when leaving a review of your experience at a homestay ;) Thanks! Actually I gave this a “No rating” according to your rating system! This place is quite special. 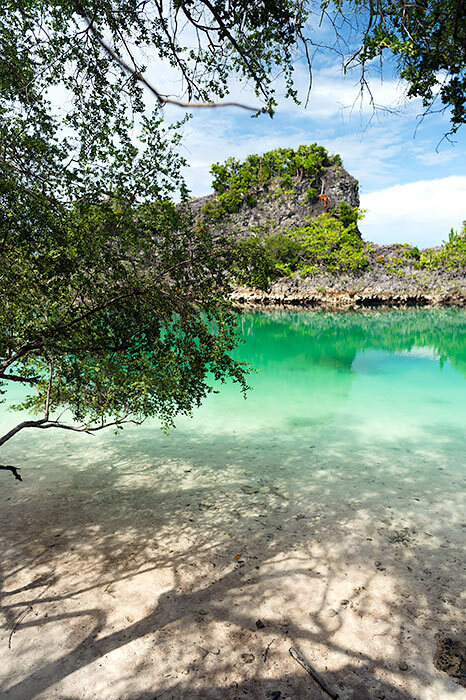 Here you can enjoy different surroundings: the lagoon, the private viewpoint, the beach and the amazing coral reefs. The room and the mattress were the best during our stay in 4 different homestays. The Homestay Association has spoken with Pak Ariens at Rufas, who says that the turtle has been a pet since it hatched. The Association explained how the display of captive wildlife is both cruel and against Association membership regulations and Pak Ariens has agreed to release the animal immediately. We hope to be able to provide some photographic proof of the turtle’s release soon. Perhaps if you are a guest at Rufas when the release takes place, you might like to film it and send it to us? 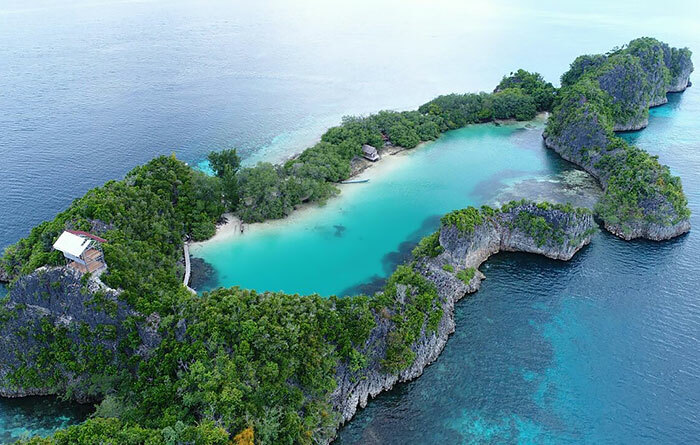 The Homestay Association is committed to preserving Raja Ampat’s terrestrial and marine environments and thanks guests for reporting these concerns. I was a guest at Rufas homestay and I saw the turtle being released on March 29. Unfortunately I have no photographic evidence of the release. The bad publicity has definitely affected the hosts and I don’t believe they are likely to do this again. Very nice place. However, we found a baby hawksbill in a net kept as “tourist attraction”. Even heard from other tourist that they were planning on maybe getting a manta ray…hope it’s not true. But those behaviours shouldn’t be permitted. As we’ve noted below, this practice is in complete contravention of the Homestay Association member standards and regulations. It also breaks Indonesian laws that protect endangered species. Action will be taken. We value reports like these, as they help alert the homestay association to situations they may be unaware of, and communicate guest expectations to homestay owners. We’re saddened though, that this series of reviews again proves that guests are far more motivated to leave complaints than they are to leave good reviews for the places that deserve them. That’s a shame, because guest reviews make a huge difference to the livelihoods of families operating homestays. Especially the newer ones that have few or no guest reviews yet. Since this homestay is keeping endangered wildlife species as pets for tourist attraction, I will not book this place. I will not support animal cruelty. Thanks for making that plain Shauna. We’re in complete agreement with you! As noted in our response to Christoph below, abuse of wildlife and deliberate environmental damage are in breach of the Homestay Association’s standards and won’t be tolerated. We expect a swift resolution of this problem and will keep you posted. It would be really helpful if you have a photograph of this that you can provide us. Please get in touch via our contact page if you can help in that regard. Thanks! BUT: The owners caught a baby hawksbill 5 which is critically endangered and now keep it as pet and attraction in a tiny 1 sqm net. I tried to convince them to release it, but without success. Wild animals belog into the wild! This cute little animal will probably die there soon. Please do not support animal cruelty. This turtle species is commonly found on the surrounding reefs. This is terrible news Christoph and is in direct contravention of Homestay Association membership standards. Thank you so much for reporting it. We have contacted the Association to alert them to this and expect that the turtle will be freed immediately. 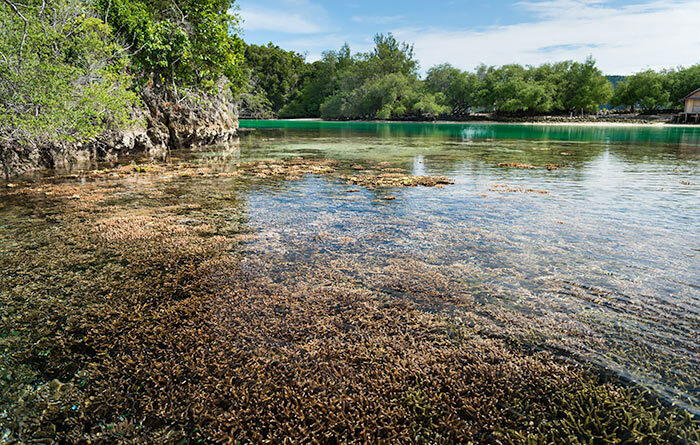 Rufas will be removed from Stay Raja Ampat if they don’t comply. There is no place on the website for operators who abuse wildlife and flout the Association’s own standards and regulations. Please get in touch via our contact page if you have a photograph of this that you’d be willing to share with us. Thanks again. Thank you so much for taking up this issue! I really appreciate your engagement! This tiny island is unique. The coral landscapes surroundings Rufas is the most beautiful and thriving i have seen since Egypt. I spent hours snorkling and enjoying the beauty. The couple is friendly. The food is allright. I asked for fresh fish and got it twice. Some mornings the ocean is clear like drinking water and the beauty is stunning. looks great ! what about transportation to others homestays ? Rufas didn’t provide us any prices for that Giustino, but all homestays can organise transfers to any other homestay.